- Bowl capacity of 1.5 lt to 2.5 lt.
Our reputed entity is engaged in supplying Crystal Lazy Susan. We have recently launched tower lazy susan which now is becoming the most sought after model among family of lazy susans. The stunning masterpiece has integrated glass crystal work that is so intricately designed & manufactured with highest quality materials. The tower which in itself is a centre piece, acts as a vase that can hold flower arrangement. A must for grand occasion. In order to meet excellent quality standards, we are supplying Crystal Lazy Susan. 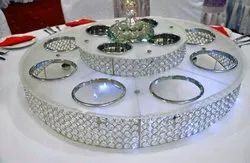 We are amongst the most reputed names in the industry, offering Crystal Lazy Susan. The crystal lazy susan is offered in various finishes and crystal colors. These are made of crystal glass and high quality acrylic that increases the elegance of diner.It holds eight-bowl and four holders for Bottle and it's offered in different sizes & thickness. We can also customize customize this in various colors acrylic plate.